The G1+ axe is designed for summit seekers. An ergonomic hot forged head from solid carbon steel. A slight curve in the ERGAL high-strength aluminum alloy shaft for more powerful self arrest maneuvers and for added clearance on more technical terrain. The G1+ also includes a Grivel leash. 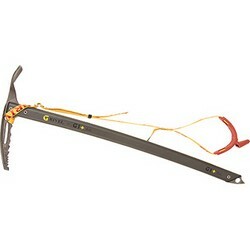 Hot forged technical spike for security when plunging into a variety of snow conditions.